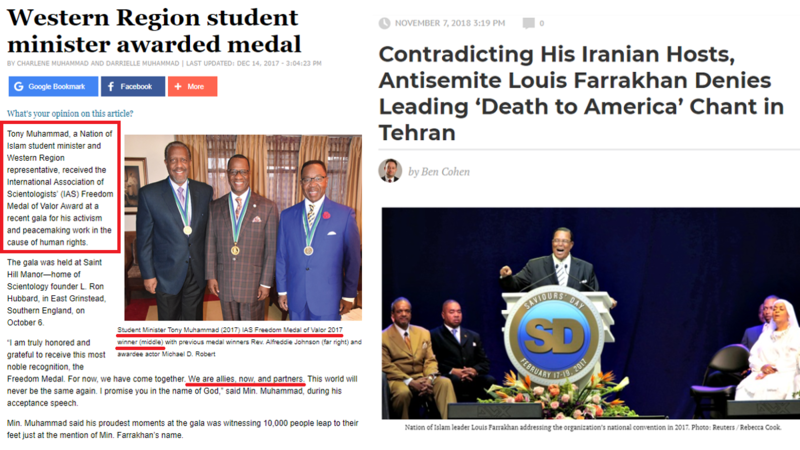 Saturday, October 27, 2018: Speech by 2017 Scientology Freedom Medal Winner Nation of Islam Minister Tony Muhammad, who lectures on "wicked Jews in high places"
"There are some wicked Jews in high places who continue to attack Farrakhan!" 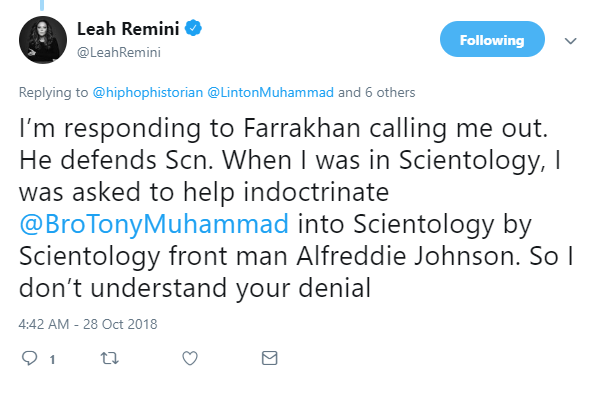 Leah Remini tweets she was asked to help indoctrinate Nation of Islam Minister Tony Muhammad into Scientology by Scientology front man Rev. Alfreddie Johnson. 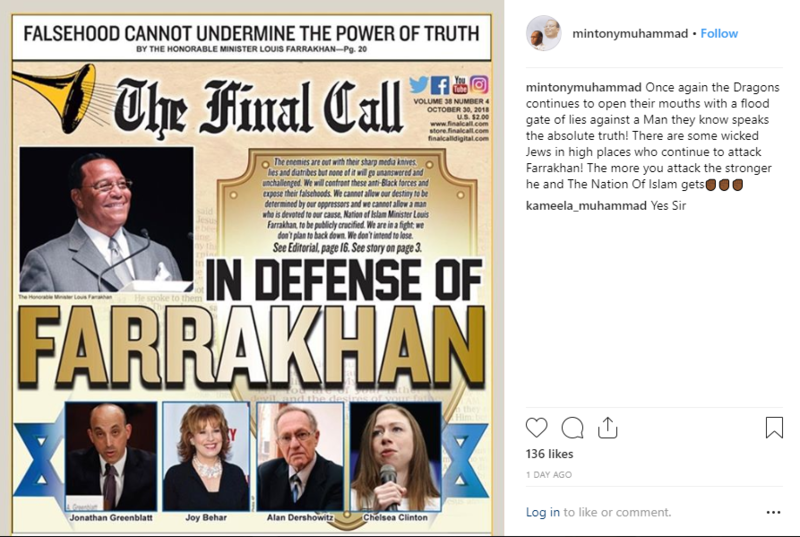 Mike Rinder has a very good post on the Nation of Islam, Minister Tony Muhammad and the Church of Scientology. 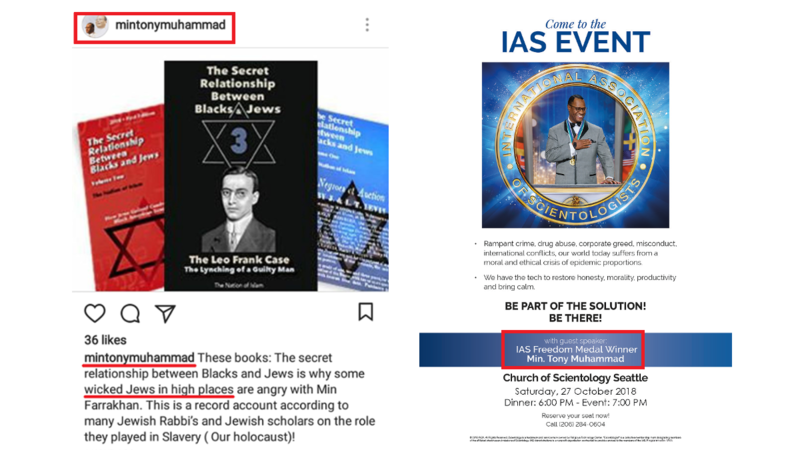 Following in the hallowed footsteps of Michael Roberts, Jeff Pomerantz and Andrik Schaapers, Tony Muhammad has hit the IAS fundraising circuit. 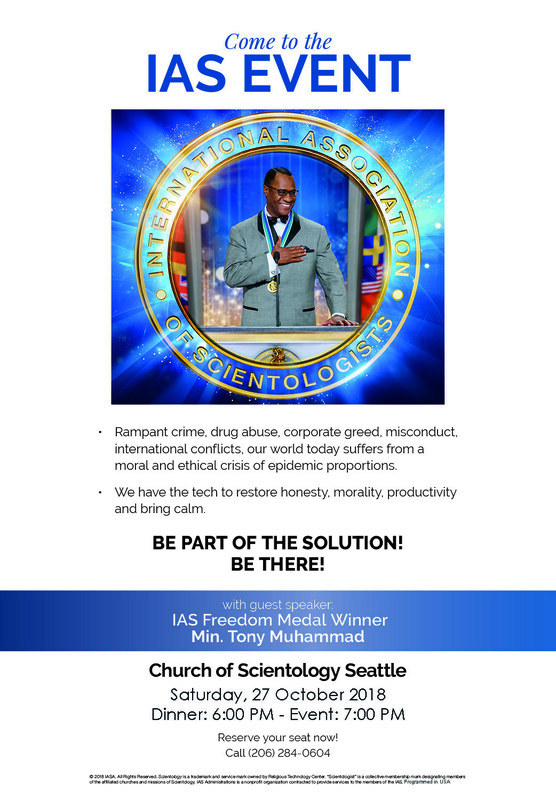 What could possibly motivate the West Coast Leader of the NOI to devote his time to promoting scientology and not his own religion? 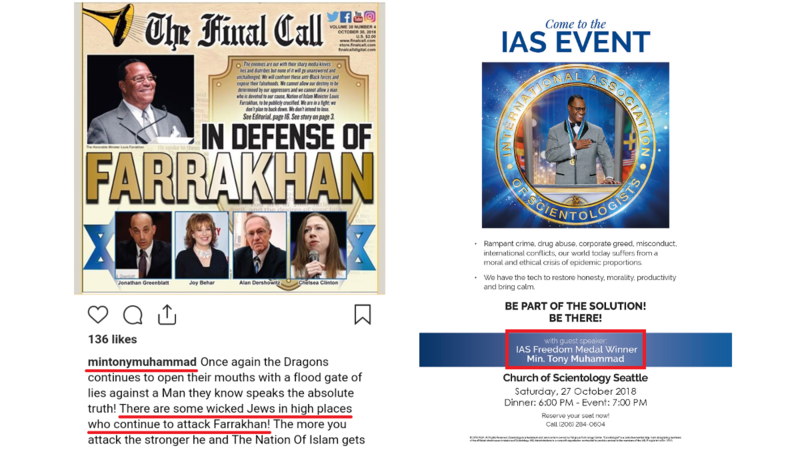 Can anyone imagine Vicki Shantz, the West Coast region head of scientology (CO CLO WUS), on a tour of NOI mosques promoting their good works? She would be in the RPF or declared a Suppressive Person in the blink of an eye. Truly the theater of the absurd is being acted out on the world stage. And what is even more remarkable. For scientologists, this is not absurd…. 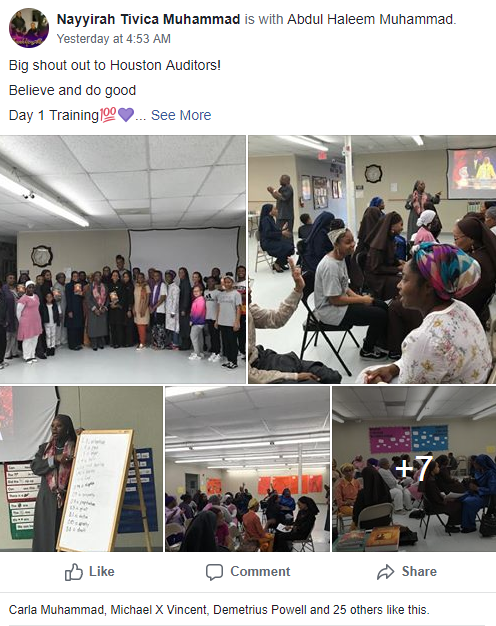 October 26 - 28, 2018: Dianetics Revival at Elevated Places, a Nation of Islam affiliated school in Houston, Texas. 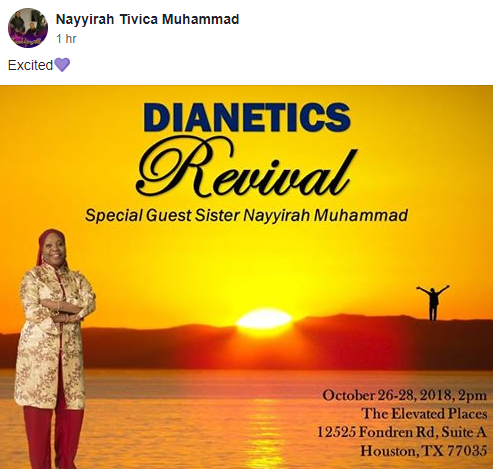 I previously mentioned there would be a Dianetics Revival from October 26 - 28, 2018 at Elevated Places, a Nation of Islam affiliated school in Houston, Texas. Photographs of the event have now been posted. 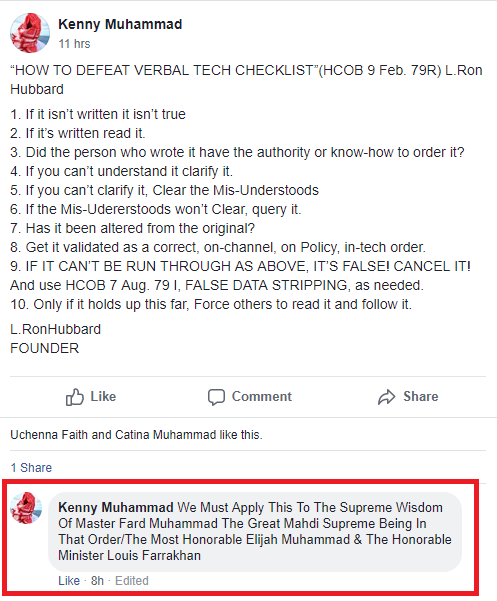 The Scientology How to Defeat Verbal Tech Checklist (HCOB 9 Feb. 79R) by L. Ron Hubbard must be applied to the Supreme Wisdom of Master Fard Muhammad, The Most Honorable Elijah Muhammad and The Most Honorable Minister Louis Farrakhan of the Nation of Islam. 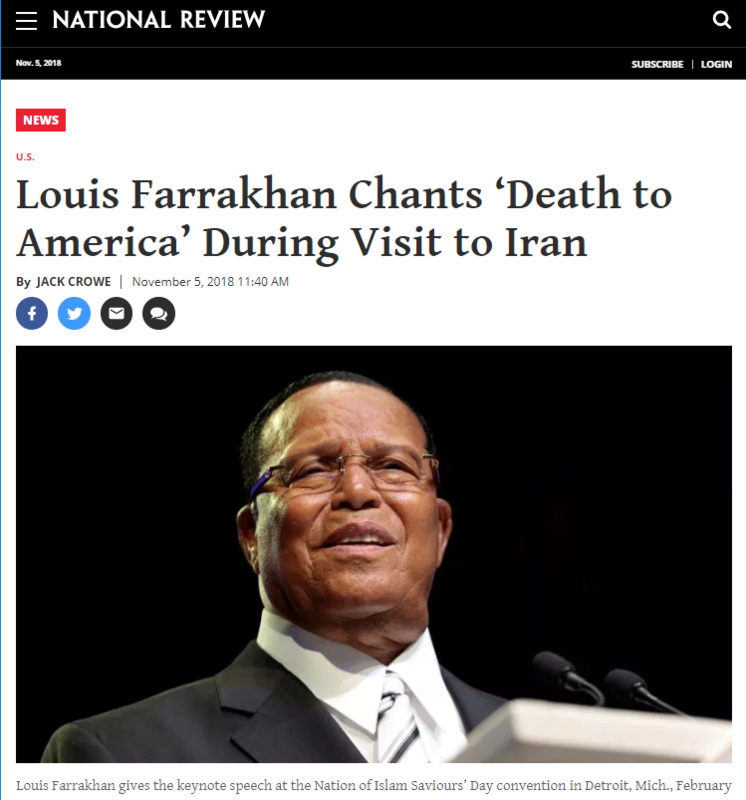 Scientology "ally" and "partner" Nation of Islam Minister Louis Farrakhan leads 'Death to America' chant in Iran. 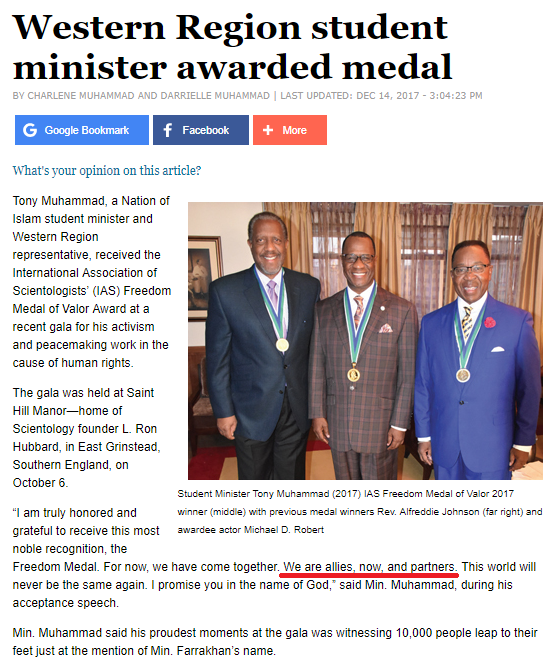 In 2017, Tony Muhammad, the Western Regional Minister of the Honorable Minister Louis Farrakhan and the Nation of the Islam, was awarded the highest honor in Scientology, the Freedom Medal. 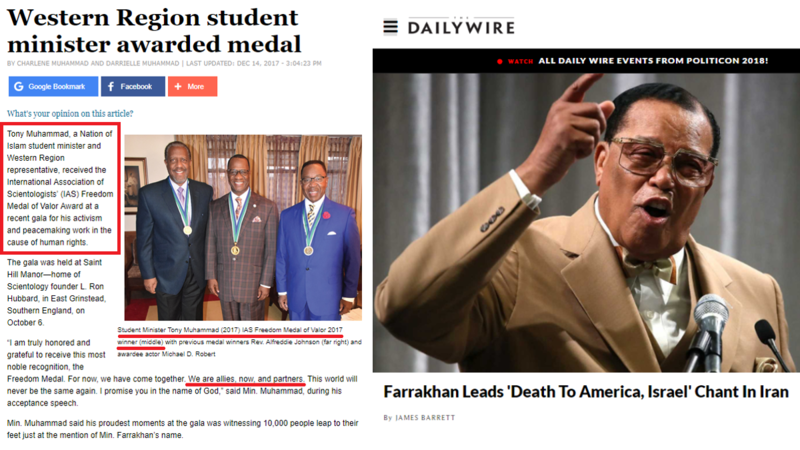 As reported by The Final Call, the official Newspaper of the Nation of Islam, when he received the medal Minister Tony Muhammad said the The Church of Scientology and the Nation of Islam were "allies, now, and partners." Beginning at around 11:40 in the following video of the Freedom Medal ceremony, Minister Tony Muhammad states: "For now we have come together. We are allies now and partners. This world will never be the same again I promise you in the name of God." They adhere to, practice and venerate the very things that enslaved people in the past and what enslaves in the present while denigrating and denouncing the very things that emancipated people in the past and present. 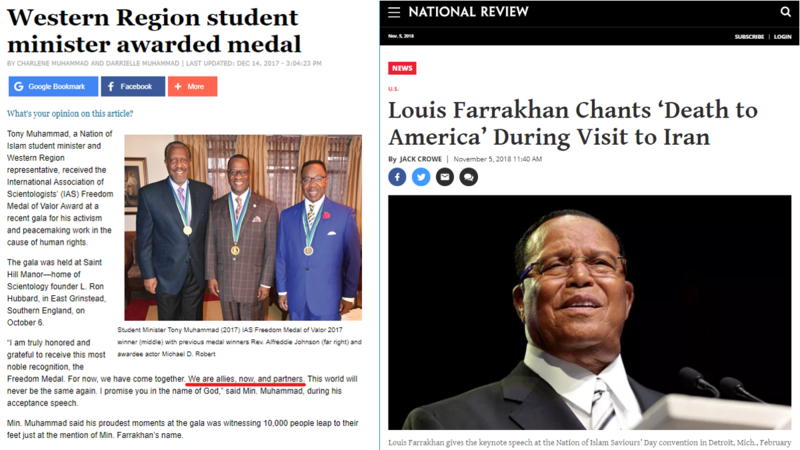 Farrakhan is a true Judas goat. 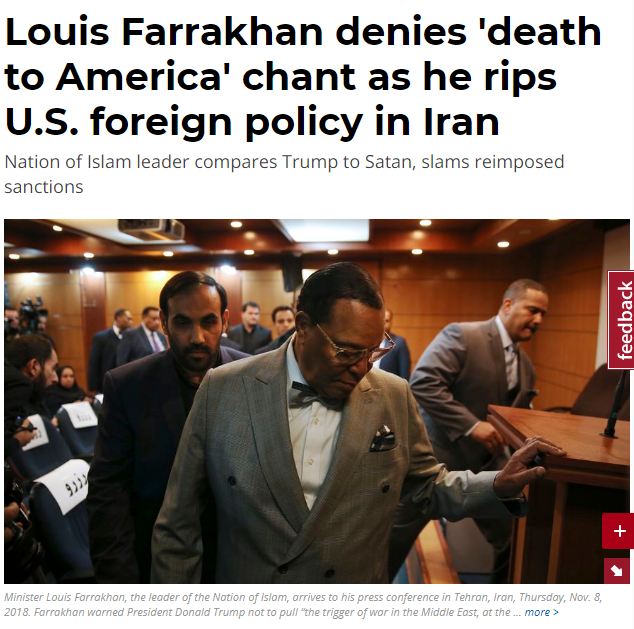 The Washington Times: Farrakhan under renewed fire for leading 'Death to America' chant in Iran. I never led a chant that called for the death of America or Israel, contrary to misreporting in U.S., British and Jewish publications and the intentional, malicious and false reinterpretation of my words. I never led a chant calling for death to America. To say otherwise is a blatant falsehood and an attempt to paint me as an enemy in a very dangerous time as tension rises between America and Iran and nations around the earth reject unjust sanctions and heavy-handed U.S. foreign policy. 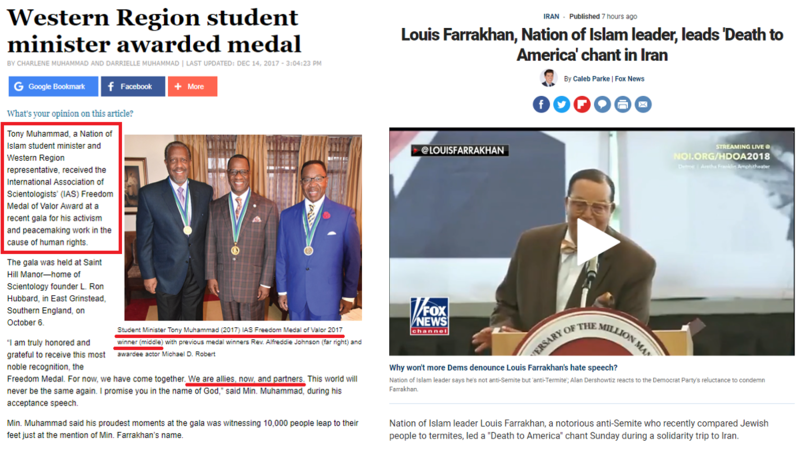 One may ask, is it Minister Farrakhan's position that he didn't "lead" the chant, he merely participated and joined in it? In any event, one can judge for oneself by watching the video at any of below links. It is important to note that Minister Farrakhan previously gave a sermon in which he stated: "America is #1 on God's list to be destroyed." 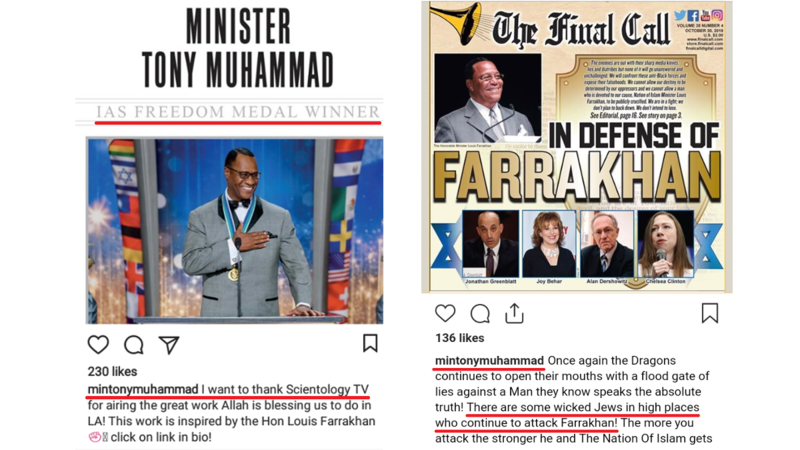 That sermon was posted to Instagram by 2017 Scientology Freedom Medal Winner Nation of Islam Minister Tony Muhammad. 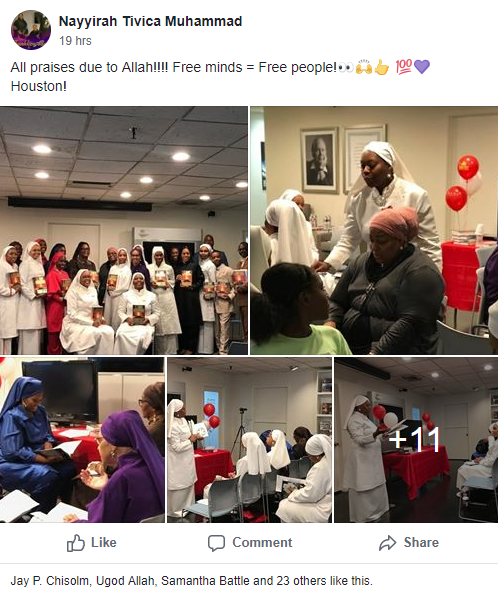 Dianetically Speaking, the public Facebook home of the Church of Scientology and the Nation of Islam, welcomes eleven new members. It appears at least ten of them are members of the Nation of Islam. It is noteworthy that Qubilah Muhammad has recently completed the 19 online courses at the Scientology website. 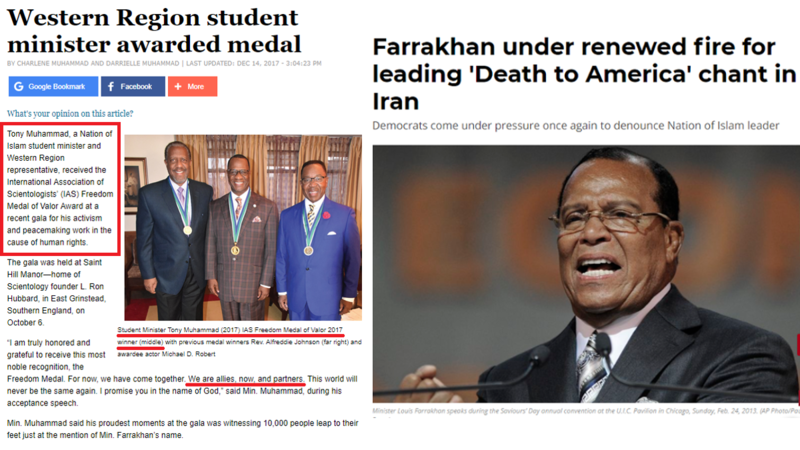 An update on the Farrkhan "Death to America" controversy. 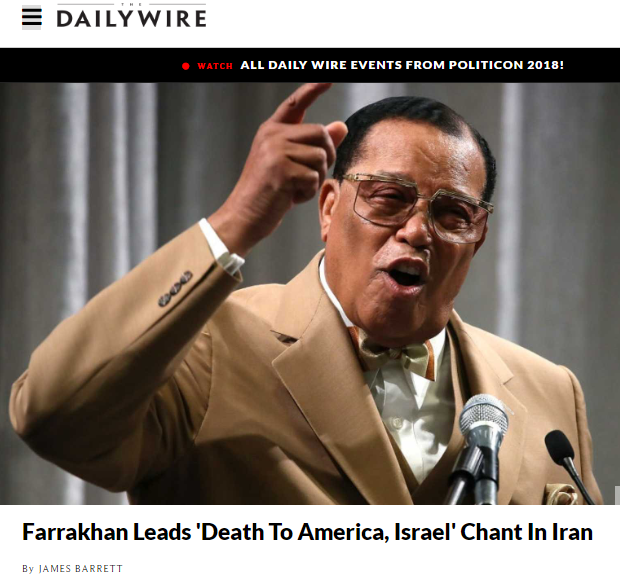 Louis Farrakhan, the leader of the Nation of Islam (NoI), on Wednesday angrily denied that he had led chants of “Death to America!” and “Death to Israel!” during a visit to Iran last week — despite claims to the contrary from his Iranian regime hosts. 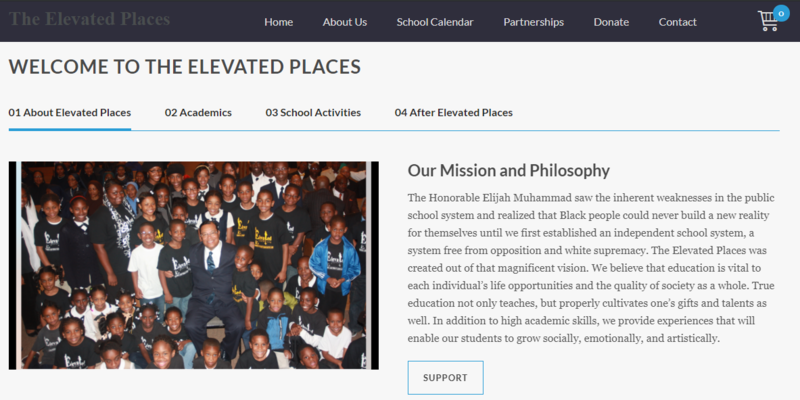 Farrakhan flatly contradicted his hosts’ claim. 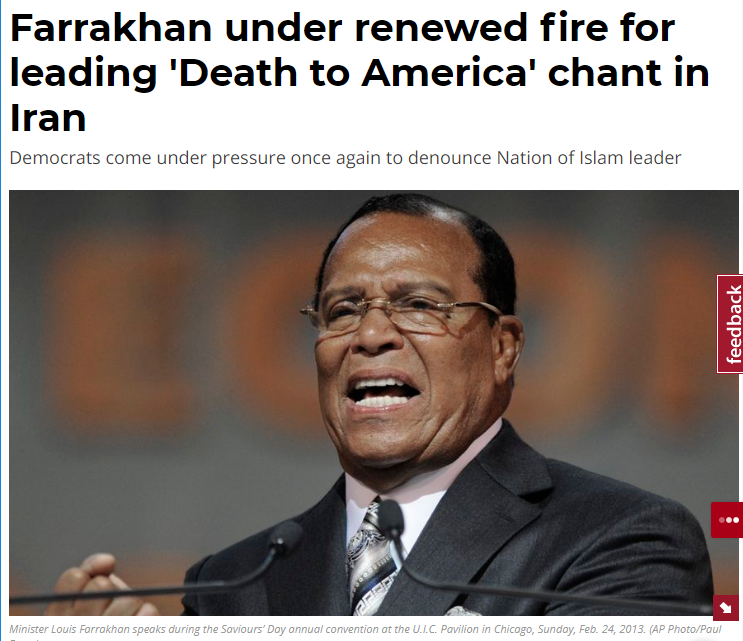 “I never led a chant that called for the death of America or Israel, contrary to misreporting in US, British and Jewish publications and the intentional, malicious and false reinterpretation of my words,” the NoI chief said. 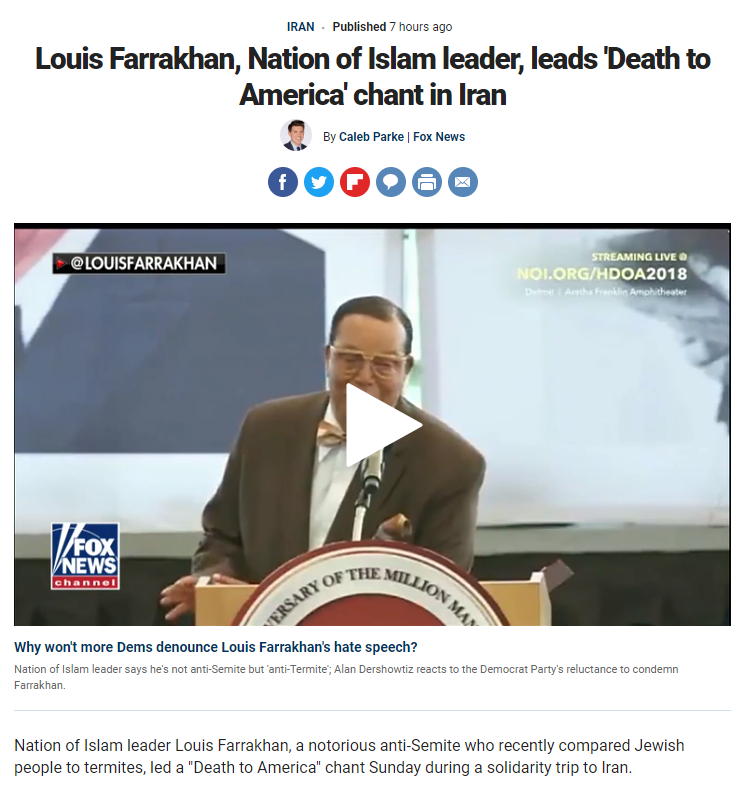 Contradicting His Iranian Hosts, Scientology 'Ally' and 'Partner' Nation of Islam Minister Louis Farrakhan Denies Leading ‘Death to America’ Chant in Tehran, Saying He Merely Asked How To Pronounce The Chant in Farsi. What the hell is sciencetolgy.com? A bad spelling or something? 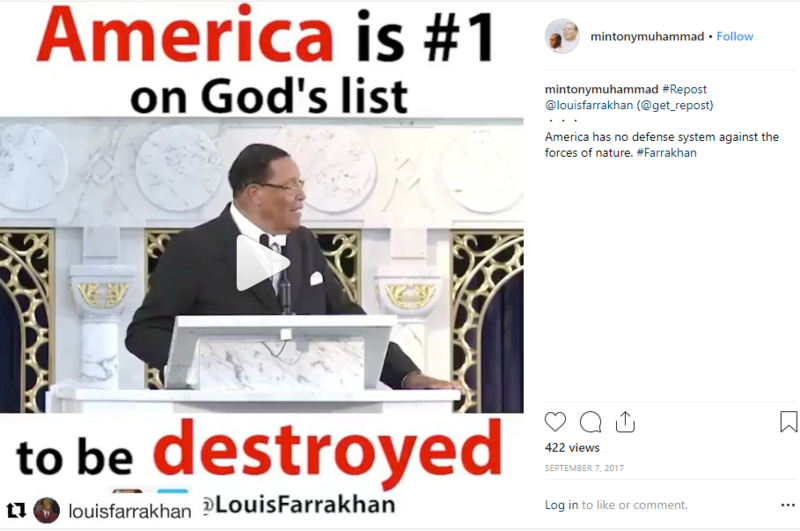 Nevertheless, Scientology 'Ally' and 'Partner' Nation of Islam Minister Louis Farrakhan previously gave a sermon in which he stated: "America is #1 on God's list to be destroyed." 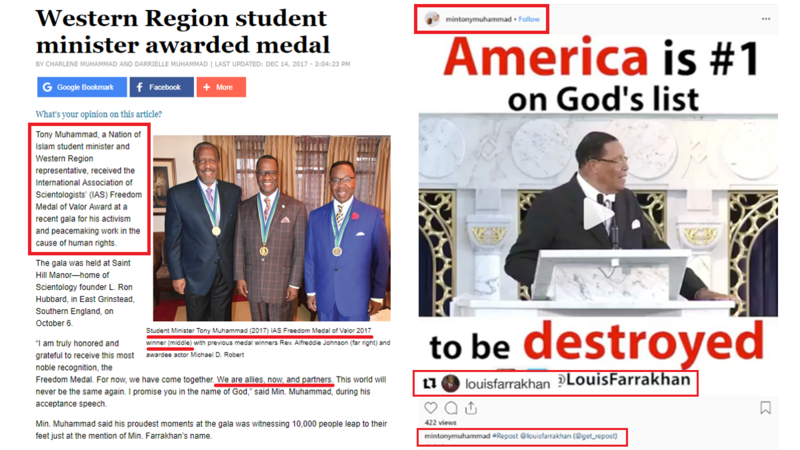 A video of that sermon was posted to Instagram by 2017 Scientology Freedom Medal Winner Nation of Islam Minister Tony Muhammad. 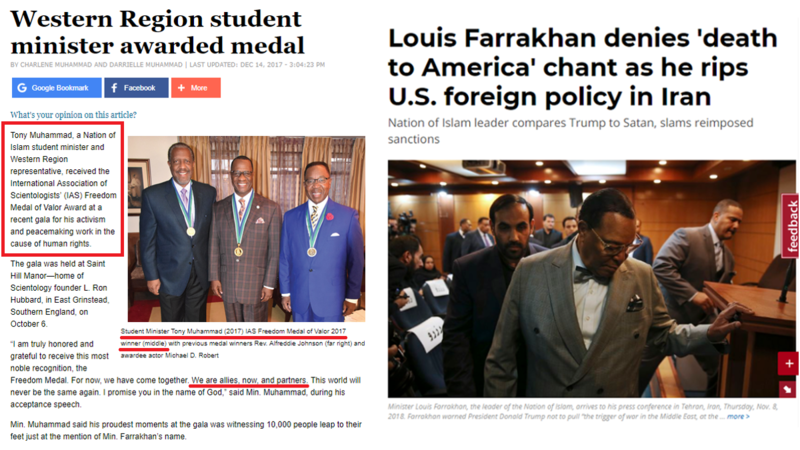 Scientology 'Ally' and 'Partner' Nation of Islam Minister Louis Farrakhan denies 'death to America' chant, saying he merely "asked a question about how to pronounce the chant in Farsi." While the following Washington Times article may not be entirely neutral, it has additional reporting and good analysis. 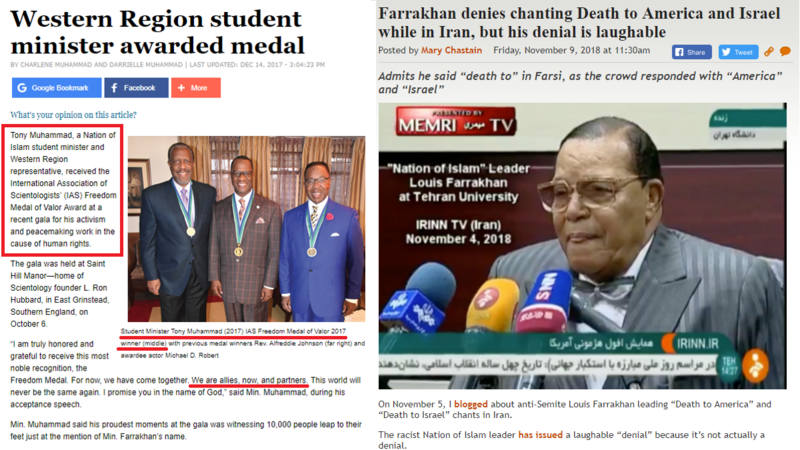 “America hates when you say, ‘marg bar Israel.’ Am I saying it right?” asked Mr. Farrakhan, flanked by Iranian officials, at an appearance before students and media. Cornell Law School professor William A. Jacobson called his denial “extremely unpersuasive, given his history,” a reference to Mr. Farrakhan’s record of anti-Semitic jabs, such as last month’s tweet referring to Jews as termites. “If his defense is he only spoke the words ‘death to,’ but he didn’t lead the chant, that seems to be the equivalent over what the definition of ‘is’ is,” said Mr. Jacobson, who runs the conservative Legal Insurrection blog. 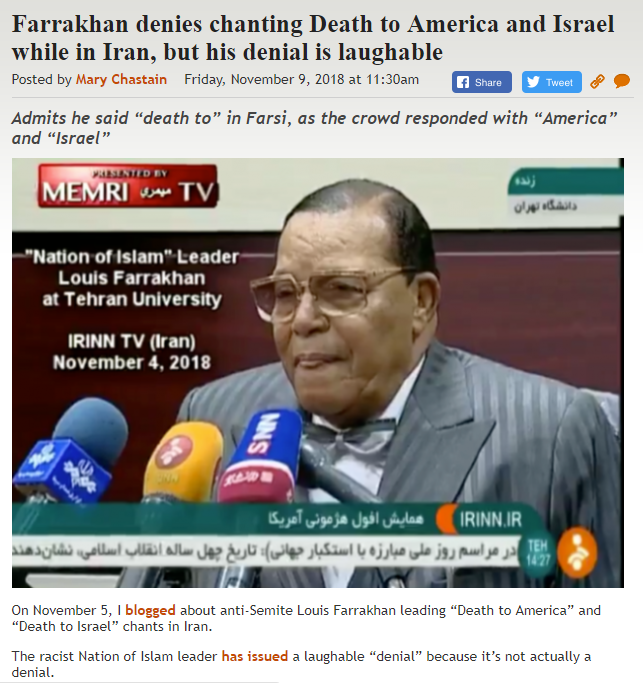 Scientology 'Ally' and 'Partner' Nation of Islam Minister Louis Farrakhan denies chanting Death to America and Israel while in Iran, but his denial is laughable.